Did you ever see the cowboy in the vaudeville, show throw a fancy knot into the end of a rope with a twist of the wrist, using only one hand, so quickly that the eye could not detect the method? It is like a trick of magic-now a straight rope, the next instant a fancy knot. It is a clever trick of the Wild West boys, yet one which any one can learn with a little practice. It is all in knowing how. In tying these trick knots it is best to use a spinning rope with a brass honda, although they can be clone with an ordinary honda formed by wiring the end back. The weight of the brass honda is a great help, particularly to a beginner. The most fascinating and spectacular of the trick knot is the pretzel. 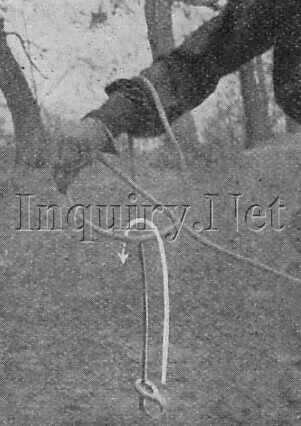 Hold the lariat as in Picture 40, allowing it to hang down about three or three and a half feet. Note that the palm of the hand is up. Now turn your wrist over quickly, throwing the rope across the back of your arm forming a loop as in Picture 41. Practice this motion. until you can do it quickly and easily before trying the second half. Then, in the same motion with which you turn your wrist over, jerk the honda up in the air and catch it in the loop as shown in Picture 42. Study the pictures-they tell the story better than words can do. Shake it off your arm and let it fall and you have the famous pretzel (Picture 42) , or perhaps you will have the figure-of-eight. Just which one you will get will be a matter of chance at the start, for they are tied in exactly the same way, but if you shake it off your wrist gently and do not jerk it as it falls, the pretzel should be the result. Practice this knot until you can do it like a flash. To do it slowly makes the stunt look cheap. And remember, you have not learned it at all unless you can do it fifty times in succession without a miss. You will be surprised how this little trick will impress the spectators. The figure-of-eight (Picture 43) is tied by precisely the same movements as the pretzel described above. Pictures 41 and 43 illustrate these. The factor determining which knot will result is the way the knot is dropped after shaking the rope off your arm. Jerk it as it falls and you should have the figure-of-eight. Shake it off gently and the pretzel should result. The figure-of-eight tends to result if a brass honda is being used, since the weight of the honda gives it a jerk as it falls, while a pretzel is the usual result when a light honda is employed. However, with a little practice either knot can be tied at will with the same rope. Practice for speed in tying these knots. The hand is always quicker than the eye, and if you are fast with the rope the trick becomes very impressive. Easier and simpler than the pretzel or figure-of-eight is the overhand (Pictures 44-45) . Hold the rope, palm up, as in Picture 40, allowing it to hang down about three feet. Turn your wrist over quickly, throwing the rope across the back of your arm forming a loop as in Picture 41. So far it is exactly like the pretzel. Now reach down with this loop and catch the honda as indicated by the arrow. Do not try to jerk the honda up through the loop: reach down under it and drop it through. Practice until you can do it very quickly. Otherwise it loses its attractiveness as a stunt. The ordinary slip knot (Pictures 46-47) can be tied as a lariat trick also, and any one who can tie the overhand described above will find it exceedingly simple. Do not try it until you have mastered the overhand. Just as you are about to catch the honda in doing the overhand, shove the standing part of the lariat held in the left hand under the honda and in back of it. (Picture 46). Then complete by catching the honda as in the overhand. Compare Picture 47 with the overhand illustration in Picture 45, noting the position of the standing part of the lariat in the two. With a little practice you will be able to shove the rope over with the left hand so quickly that the spectators will not detect the use of the left hand in the trick. This trick consists of tying an overhand knot in the end of. a 30 foot lariat by holding on to one end and throwing a half hitch in such a manner as to catch the loose end, thus forming the knot. Lay the rope out in front of you, jerk the end toward you, and at the same time throw an overhand half hitch down the rope, through which the end passes forming the knot. Use plenty of slack in throwing the half hitch. This knot requires a great deal of practice and is often discouraging. It has little value, being neither useful nor especially spectacular. Ernest Seton's "Knots for Woodcrafters"
Dan Beard's "Knots, Bends, and Hitches"